Hi Everyone, Today I have for a recipe that I made as my Husband watched San Francisco barley win the play offs! But they did it and won!! Yah 49r’s! Were off to the Super Bowl!! Woohoo!!! In celebration of the 49r’s big win, I’m throwing a party and your invited!!! So grab your favorite Super Bowl recipe and link it below!! 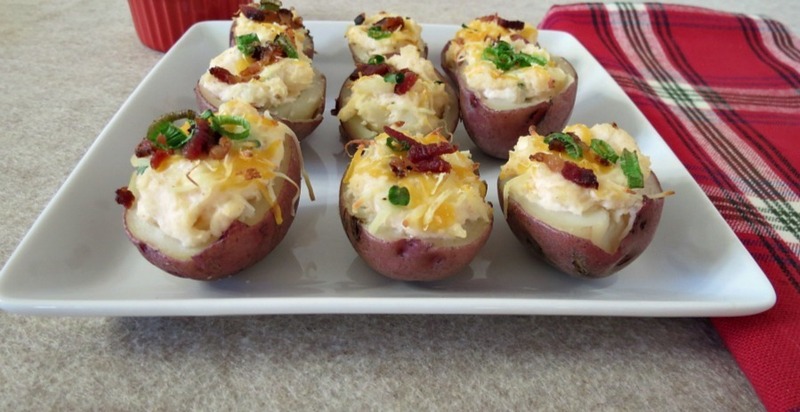 My recipe for you is fully loaded baked potato skins with cheese, bacon and scallions! Yum!! When we were at Buffalo Wild Wings my Husband ordered the sampler platter and they had potato skins on them and ever since then I have been craving them. This is actually the first time I have ever made them and let me tell you they turned out phenomenal ! Each bite you get a little piece of everything, so perfect!! I gave my Husband 9 of them and he said he can’t eat them all, next thing I know, he ate them all. He told me they were really good! Ha ha and he doesn’t know I used greek yogurt in it!! This recipe was pretty easy to make. I boiled my red potatoes and once they were done and cooled, I spooned out the center, and reserved the potatoes I scooped out. Then in a bowl I added greek yogurt, cheddar cheese, salt, pepper and smoked paprika and then re-stuffed the potatoes. I topped the potatoes with bacon crumbles, scallions and more cheese. Bake in the oven for 10 minutes and they are done!!! This is one appetizer that I am happy to make. This recipe took something that I thought I wouldn’t be able to have again and feel good about it. It’s amazing that you can take not so healthy food and make it good for you!! I don’t know why potatoes get a bad wrap, they are so good for you!! Full of potassium and nutrients. I love them!!! You know what the best part of the recipe besides that they taste so darn good is that they are only 98 calories for two halves. You can’t beat that for potato skins! Guilt-free!! This is one guilt-free appetizer that you can serve at your next party and know one would have a clue that they are pretty healthy!! 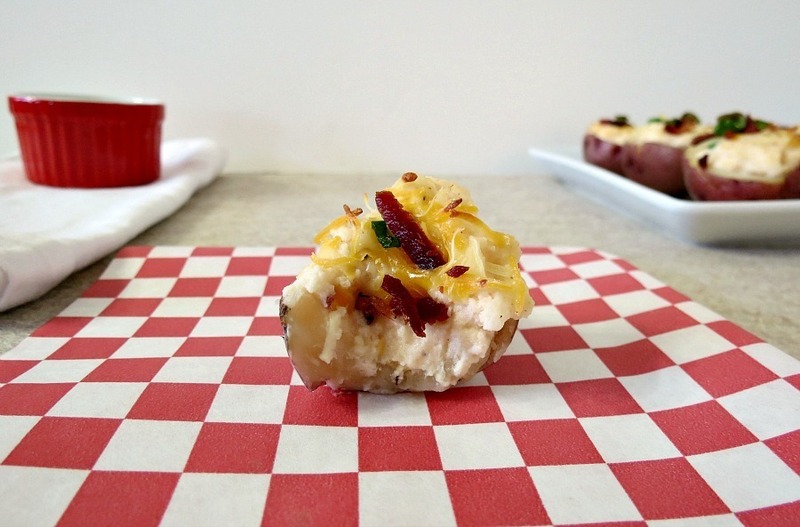 A guilt-free fully loaded potato skin filled with cheese, scallions and bacon. In a large pot, add potatoes and enough water to cover the potatoes. Bring to a boil, and cook potatoes for approx. 20 minutes, until fork tender. Drain potatoes from water and set a side until cool enough to handle. 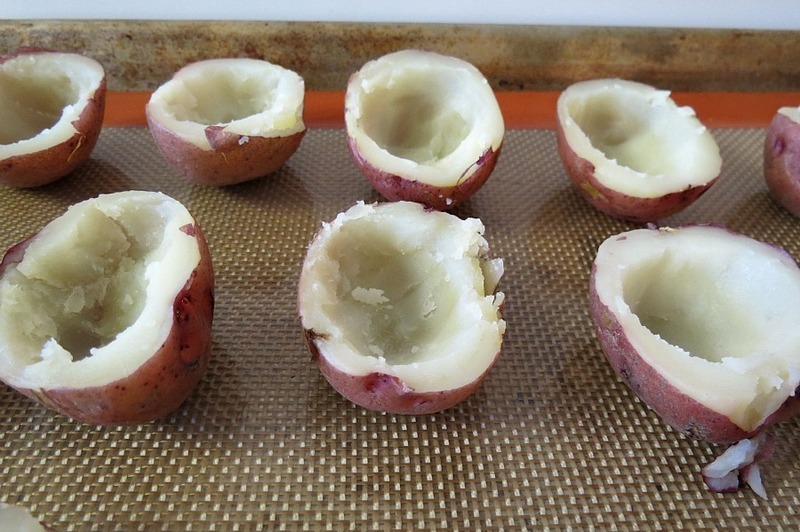 Once potatoes are cooled, cut potatoes in half. Using a small spoon, carefully remove a small amount from center, leaving a rim around each potato. Set reserved potato aside. Line a baking sheet with parchment paper or a Silpat; set a side. In a bowl, add the potatoes reserve, greek yogurt and mash until creamy. Add 2 tbsp. cheese, salt, pepper and paprika. Mix until combined. Stuff the potatoes with the filling. Sprinkle the tops of the potatoes with remaining cheese, scallions and bacon. Bake for approx 10 minutes until cheese is melted and potatoes are warmed. Serve with ranch dressing, sour cream or my favorite adding a dash of hot sauce! Hi, I used 9 potatoes, which was about medium in size, about the size of two ping pong balls. Hope this helps. Ahh, even though I like the 49ers, I’m so sad that they beat the packers a few weeks ago 🙁 But I am rooting for them during the superbowl! This dish is great, I love loaded baked potatoes but all those toppings ruin a food that can be pretty healthy. I never thought of scooping out the insides, awesome idea! So yummy! 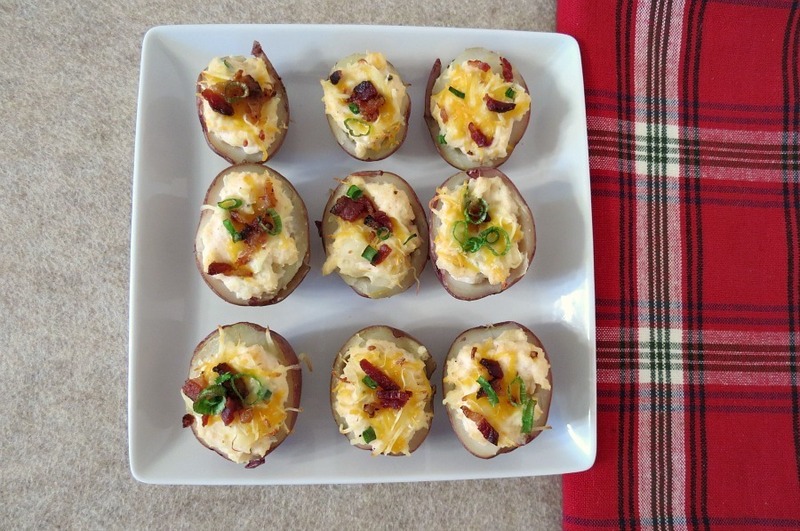 I love potato skins – they’re the perfect game day food too! Great recipe, thanks for sharing Jennifer. 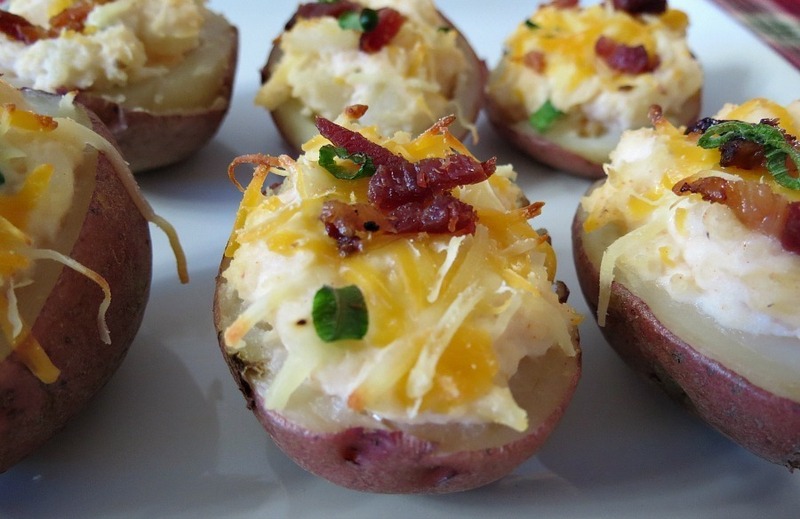 My husband keeps requesting potato skins…I need to try your recipe! I’m thinking my boys will go crazy over these for Super Bowl! Wow! Potato skins are a weakness of mine. These look fabulous! Thanks Stephanie! They are kind of a weakness for me too! I love them with a dab of hot sauce on it! Yum!! Oh yum, now I want some of those, right away!!! And I just had lunch! !